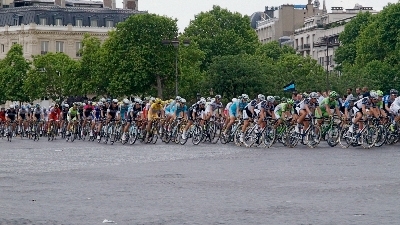 For once, I wanted to see the Tour de France arrive in Paris and make its last rounds on the Champs Elysée. Of course the proper thing to do is to bike to Paris oneself. I choose roughly to repeat the trip I made in 2001, which goes in a direct line from Amsterdam to Paris. I managed to cut it up in fairly even laps, adding up to a total of 591km. Below a short description and the track — all information as it was in 2014. The first lap brought me to Dordrecht, crossing through the ‘Green Heart’ of the Randstad: the polder area in the middle of the city circle of Amsterdam-Haarlem-Leiden-The Hague-Rotterdam-Utrecht. Mark the big transmitters in IJsselstein (to your left) and Lopik (to you right) before you cross the river Lek at Schoonhoven. Woerden, Linschoten, Schoonhoven, and Oudewater (a short detour of the track) are all old picturesque cities worth a visit. The next lap brought me to Mechelen. Over the Moerdijkbrug, through Breda, and through a pleasant Flemish countryside. Not many black-and-white milk factories in green fields anymore, but other agricultural landscape, mixed with small villages and patches of forests. That landscape continues till Doornik (Flamand)/Tournai (Wallone). 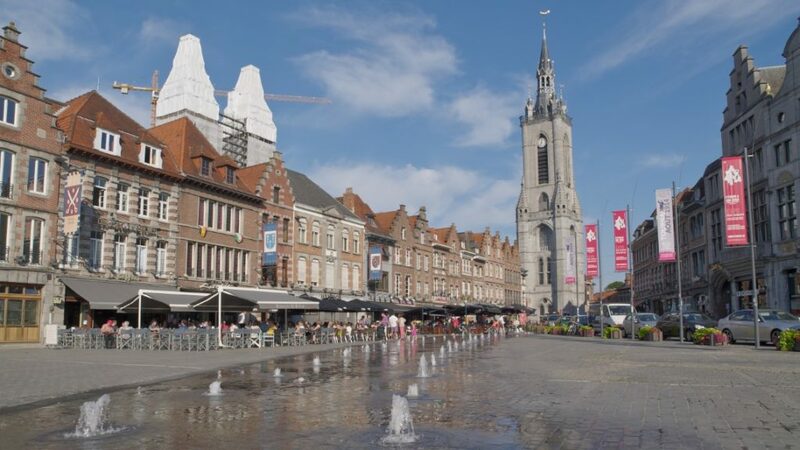 Along the road, one passes several interesting, historic cites: Lier, Aalst, Oudenaarde, to name a few. One also enters the war-zone of the ‘Great War’. When I rode this route in 2014, there were lots of displays commemorating events in this war. From Tournai on, you enter the grain belt of France: fields with corn and other crop stretching out to the horizon. Also, permanent signs of the ‘Great War’ appear. After Chauny, there are numerous memorial sites and graveyards along the road. From Cambrai till roughly Crépy, you pass through a hilly area. The hills can be up to 10, 15%, but they have a nice flow: set yourself in a low gear, and work up the slope in a steady pace. I basically follow the route from place to place as signposted by local road authorities. Just after the Moerdijkbridge, between Dordrecht and Breda, I tried to follow my intuition, which in real life took me a km extra or so, and some time, but after tidying up the track record, there is a track which is somewhat shorter than the signposts offers. After Crépy (just over halfway between Chauny and Paris) I took a wrong turn and ended up taking a longer route. Going from Crépy via Nanteuil to Juilly could have been shorter. Still, the detour as recorded on the gpx-track only adds some pleasant countryside kilometers to your trip. Almost the whole route one can ride with kids who in daily life ride back and forth to school on normal roads. Bicycle lanes are abundant in The Netherlands. Belgium is doing its best, but sometimes has to find a good solution for leading you onto the bike lane, or off the lane. Unfortunately, there are still some spots where there is a two-way bike lane on one side of the road without physical barries, which is a bit awkward when it puts you at the left of the road. For the bike lanes in France, if they are available, the same lack of consistency as in Belgium is an issue. Otherwise, people are at least very carefull when bicyclists are around: every day I have seen at least one near head-on collision because drivers took more than enough space to pass me. 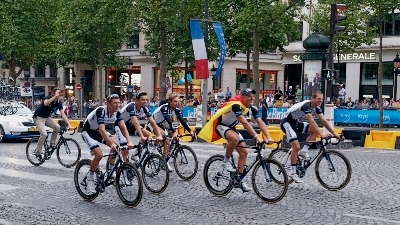 Okay, I was wearing an Argos Shimano Team set, and I have the impression people like this young team from the TdF2013 (same goes for Giant Shimano team in 2014, I think). One serious warning: going from St. Quentin to Chauny the track leads you over the D1. I choose this because it is more direct. But, the D1 here is a dual carriage way, freeway-style, with no shoulder and no emergency lanes, where bikes are allowed. Speed is 110km. For North Americans this is not completely unusual — having lived in Vancouver, I kow how to ride these kind of roads — but this particular road I found a bit scary. Don’t do this with kids, I would advise. I used the hostels from Hosteling International, except in Chauny, where the hostel is not listed anymore. The hotel in Chauny I booked was perfect. Only remember that Chauny is not a tourist center. The village closes around 20.30, then you only chance on food is a pizza restaurant at the SNCF-station. I took the Thalys back home. Officially one has to take one’s bike apart and wrap it in a bag. The bagagespace indeed does not fit a bike. Still, I saw a father and son walking their bikes to their coach, so it might be that one does not need a bag. I took my bag with me al the way from Amsterdam. Trip statistics can be found with the individual gpas tracks below. The number of meters climbing between Amsterdam and Dordrecht are a bit overrated because the Garmin is adjusting itself to the air pressure in the first hour of the trip. Once on one’s way, it picks up correctly where it ended the day before. Book here your hostels for this trip. Restaurant Le Molière, just south of Les Halles, offers good classic French food — no tourist trap: they serve a nice andouillette. Book your hotel at Chauny here (they have a safe place for your bicycle). This is the complete gps-track of the trip from Amsterdam, postalcode 1019 DP, to the Youth Hostel Cité des Sciences in Paris. Please read the article above for important information on the route, especially the section on safety. Amsterdam (postalcode 1019) to Dordrecht (Stayokay Hostel): 90.4km; 22.7k av., 147m of climbing. Through the ‘green hart’ of Holland. Dordrecht to Mechelen (HiHostel): 123km; 20.8k av., 261m climbing. Breda was a mess in 2014 due to redevelopment of the Railway station area. A normal route should exist now. Mechelen to Tournai/Doornik (HiHostel): 115km; 20.9k av, 413m climbing. From Oudenaarde one follows the valley of the Scheldt (Schelde); an alternative for this part is Ravel1. Tournai to Chauny (Le Chateaubriant): 130km; 19k av, 919m climbing. From Denain to St Quentin this is the least memorable part of the trip. The D644/1044 between Cambrai and St. Quentin is relatively busy and a bit narrow. This track contains the tricky part over the highway, just south of Saint Quentin. 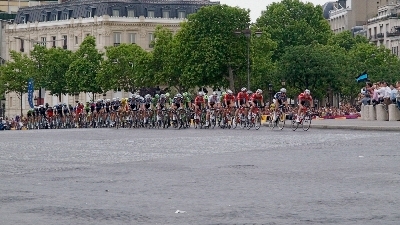 Chauny to Paris (HiHostel Cité des Sciences): 132km; 17.6k av, 954m climbing. As always, at Pierrefonds it is overcast. 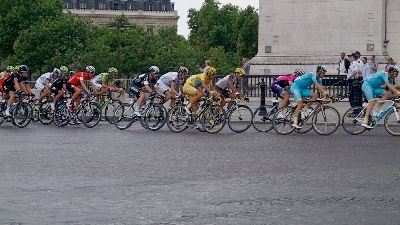 I took a wrong turn at Crépy-en-Valois, adding maybe 10 km to the route. As it happened, I passed just west of where some of the confrontations between French and German forces took place in 1914, in the environment of the villages Iverny and Villeroy.